Heading out on a family vacation this summer? I know that everyone are heading out on a family vacation this year has likely thought of everything for their kids. Chances are you’ve packed everything but what about the essentials you need for yourself? Water Bottle - I always travel with a water bottle. Keeping a water bottle with me is how I make sure to get hydrated. You know it is important to keep hydrated as you travel. Foldable Ballet Flats - a backup pair of foldable and lightweight ballet flats is a fantastic option to throw in my purse that won’t take up much room. Travel Magazine - to keep me entertain while on the road or at the airport. Wallet & Pen - I keep a pen in my travel wallet at all times. Lip Gloss, Lip Balm, Face Powder and Foldable Mirror/Brush - my simple beauty essentials when traveling. Band-Aids and Small Packets of Wipes - you never know when you might need a band-aid and wipes. Camera - I can't imagine traveling without my camera. First Aid Shot Therapy - Managing your health while you travel can be a challenge, and when a headache or back pain hits you, the sippy cups full of juice, board games and endless amounts of snacks that you have packed for the kids aren't going to help! Good thing First Aid Shot Therapy has developed a line of convenient, FDA-compliant, single-dose liquid medications. These medications help relieve pain and other common ailments FAST – and they fit conveniently in your suitcase, carry-on bag or purse! No need to search for pills or spring for an over-priced bottle of water to wash them down. 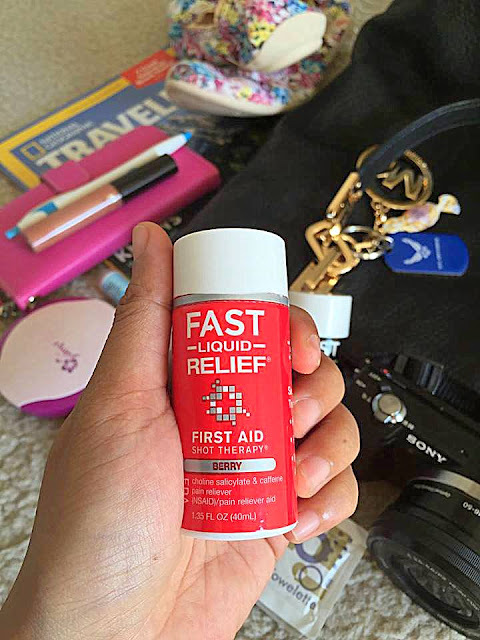 First Aid Shot Therapy’s liquid formulas allow for easy consumption and fast relief – and their size allows for easy on-the-go storage. I personally like the BERRY flavor of Fast Liquid Relief for PAIN. This revolutionary new medicine comes in an easy-to-use 1 shot dose format, and it starts working in minutes to provide fast acting pain relief. This single dose treats headache, pain, and muscle ache. It's definitely a perfect travel companion. Don't forget to grab one at your local HEB stores in your area or you can also purchase it on Amazon.com. How about you? 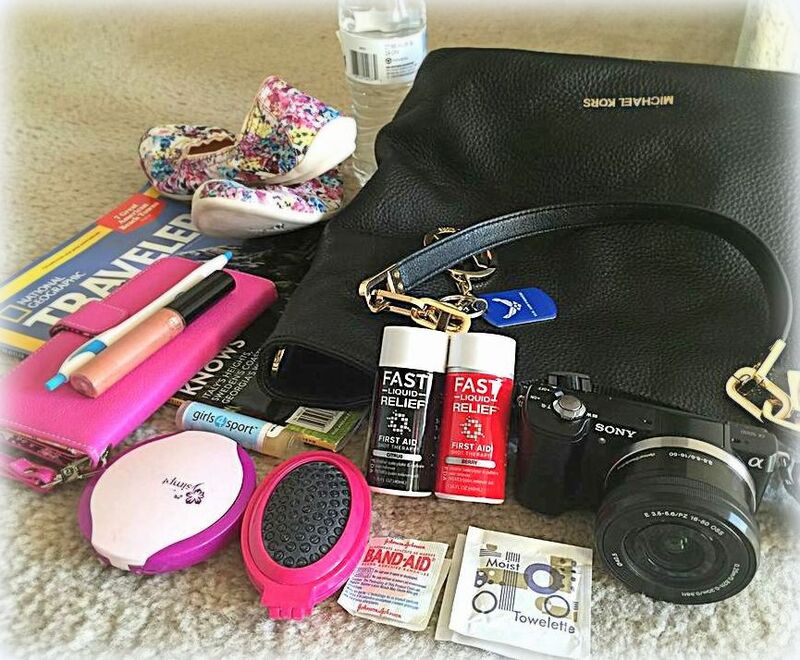 What's your Summer Travel Essentials? I always have Neosporin and band-aids with me when I leave the house. You never know when you will need them. Oh the bandaids, I always carry them with me. They are something that we need and seem to use on every outing with my boys! Band-aids, neosporin and alo-vera are my go to supplies when I pack for a family trip. Ya just never know. These are definitely some great things to bring on trips. You have to be prepared for as many situations as possible! First Aid Shot Therapy will be perfect for our trip to Disneyland. First Aid therapy shot sounds like a must have for everyone. Hope it's available here at my location. I haven't heard of First Aid Shot Therapy until now. This will be perfect to bring on vacations. Traveling is out of the picture for us this summer, but that First Aid Shot Therapy would be perfect for my hubs tool box at work! & in his truck. & in my Jeep. &...well, anywhere! Oh man, I've had headaches totally ruin a part of a trip. Once an international trip! I keep something in my purse now, for the just in case.